A new style of pop-up camping in the South West has us all in suspense... where will they be next and how can we join them? If a picture paints a thousand words then Korowai Camping have an essay or two on their hands; a hefty dissertation maybe or a weighty paperback novel. It takes only a glance to be struck by just how cool this set up looks. Suspended amongst the trees like a floating, trampoline village the campsite has a slightly otherworldly feel about it, only enhanced by the ethereal woodland setting. Korowai defies the descriptive phrases of any normal place and can truly claim to champion something a little bit different. Needless to say, we love everything about it. In a sense, though, a picture is all it is. Korowai Camping doesn’t last for long. It’s a fleeting site in the woodlands, lasting only on your camera screen as tents are folded down around you, boxes are packed away and an entire campsite set-up is shipped off to somewhere new. This is a pop-up campsite in every sense of the phrase, up in the trees and up in the air, campers here get to live and breathe in the UKs finest forests, with the scent of sap tickling their nostrils and the smell of wood-smoke seeping deep into their clothes. Created earlier this year and appearing throughout various locations in the South West of England, Korowai Camping is not a campsite but a moving camping ‘event’ that arrives in various locations before disappearing from the trees like squirrels into a dray. Already Korowai have much-coveted permission from the Forestry Commission to appear in Haldon Forest, Cardingham Forest, Bellever Forest and Idless Woods but they creep into the trees with the stealth of roe deer and can be just as elusive once there, appearing for no more than 28 days before packing up to move somewhere new. As you might expect Korowai Camping is about offering an experience truly connected with nature. There’s a real wilderness feel and a ‘tread lightly’ ethos that means you leave the woods just as you found them. “Back to basics”, is how the team behind the concept describe it, but there’s a serious element of infrastructure here too. The tents are set up when you arrive, a kettle is on the boil and roaring campfires are kindled at a central spot each evening for a friendly camping gathering. Each site also has a communal ridgepole tent with a well-equipped camp kitchen, seating and dining area and refrigerating facilities, plus, of course, there are composting toilets and off-grid showers. It’s hardly sleeping rough then, in fact, hovering above the lumps, bumps and mossy tree stumps, the sleeping is blissfully smooth. No, the camping here is wild, woody and carefully eco-conscious but also ready for anyone looking for a few basic on-hand facilities. 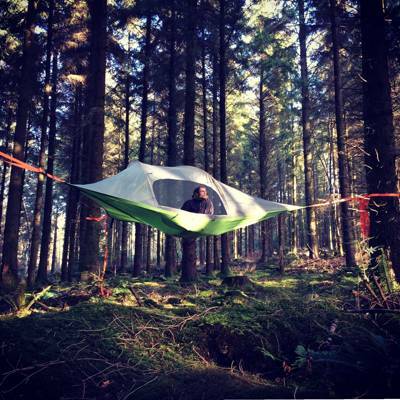 Cool as the tree tents may look, the reality behind the concept is more than just a gimmick too. Sure the bat like tents are eye catching and stand out as you flick among more standard camping scenes, but hanging out amongst the trees also has some very practical bonuses. For starters, campers don’t lose all their body heat into the ground in the same way as normal tent camping and there’s also a little extra height for views out beyond the pines. Then there’s the amazing communal zone that Korowai Camping seems to create. Being suspended slightly cuts you off from the normal in-and-out of sitting around your tent. Instead campers end up grouping in their little communal modules, enjoying company and sharing tree-top tales. Korowai’s ‘trilogy tent’ in particular features three different sleeping areas and a central, communal porch – a real mid-air social den for grouping with your friends. The coming and going of each site leaves a surprising satisfaction. Every camper can leave knowing they’ve had a truly unique experience, not only the unique little community the woodland site creates but also the knowledge that the campsite isn’t there for long – you won’t be returning next time. Instead, it is probably the only campsite to which you can return year on year and always find something new, not only new folks and new experiences but also an entirely new location. Bring a camera to make it last and maybe take a friend or two – if you don’t mind a little hanging around then it’s just the site for you. Korowai Camping offer bespoke tree tent camping at various locations throughout the year. Stingray 3-person tents start from £35 per night. See www.korowaicamping.com or contact Leo and Fearn (07713114554) info@korowaicamping.com for more information.